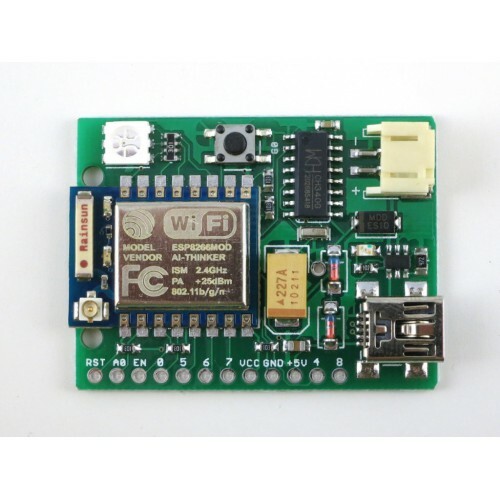 ESPToy is a WiFi development board for ESP8266. It comes with a color LED, button, microUSB cable, CH340 USB serial, LiPo battery jack and charging circuit. Note: this is version 1.24. It comes with a demo software written in Arduino (with ESP8266 core). ESPToy is a WiFi development board for ESP8266. It comes with a color LED, button, microUSB cable, CH340 USB serial, LiPo battery jack and charging circuit. Note: this is version 1.24. It comes with a demo software written in Arduino (with ESP8266 core). Unlike the previous versions, the demo software is no longer written in Lua, primarily because Arduino is significantly more efficient in terms of memory. You can program it using Arduino with ESP8266 core. If you prefer Lua, you can flash the Lua firmware yourself to ESPToy. One color (RGB) LED, one push-button (wired to GPIO0, for bootloading, and can function as a general-purpose pushbutton). On-board micro-USB port, CH340G USB-serial chip. On-board 3.7V LiPo battery jack, charging chip (TP4054) and indicator LED. Additional pin headers for connecting external components and breadboard experiments.